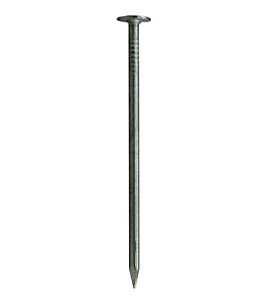 PRODUCT: 5" Electro-Galvanized Tile Roofing Nails, 8 Gauge (0.162), 7/16" Head, 50 Lb. Box Price/Box. QUANTITY: PACKAGING: 50 Lb. Box. About 33 nails / lb., 1585 to 1660 per box. OPTIONAL SIZES: Available in 4, 5, 5-1/2" and 6" lengths and in stainless steel or copper materials.